Before you are a professional, you are a beginner. Being an expert means spending many hours to master a particular craft. If you are thinking about mastering poker, you have to know the basics first and work your way up. You have to know that in the 16th, Germans started playing “Pochen”, which is a bluffing game. The French also developed the same game but called it “Poque”. This game was then brought to New Orleans, United States of America. However, it was in the 1830s that the game was polished and called Poker. Poker is a game of skill and strategy more than the betting. It is not based on luck like other games. What is the pack comprised of? One pack has a standard fifty-two cards excluding jokers. Poker is considered one-pack game but clubs these days utilize two packs with different colors to accelerate the game. The hand rankings will depend on the variety of poker. For Texas Hold’em, Omaha and Five Card Draw, for example, use traditional poker rankings like Straight Flush, Four of a Kind, Full House, Flush, Straight, Three of a Kind, Two Pair, One Pair, and High Card. Betting is the essence of a Poker. It is the reason why many consider this. 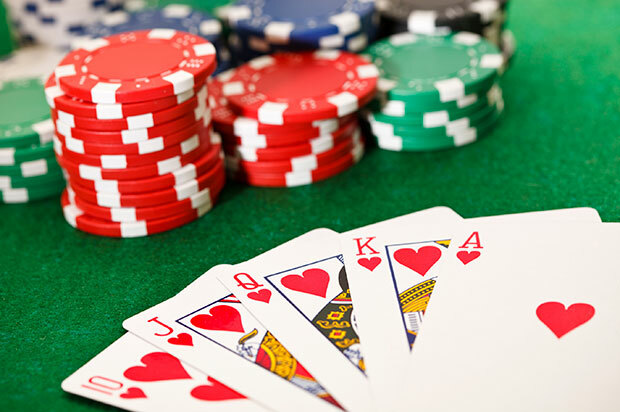 Before dealing, players are required to put “ante”, which is the initial contribution in the form of chips into the pot. You have to know different terminologies like “call”, “raise” and “drop”. When you hear “call” it means putting the same chips in the pot. When you hear “raise”, it means putting more chips in the pot. Lastly, when you hear “drop” the player does not put any chips in the pot. There is no limit when it comes to betting. However, there are some players who put limits. After fixing the limit, the players are not allowed to alter it unless they agree to change the stakes again. The chips are your currency. The white chip (or any chip with the lightest color) is the minimum “ante”. The red (or other colored chip) is five times worth the white chips. The blue chip (or any dark-colored chip) is ten or twenty times worth the white chips. Before the game, the players should purchase chips. Players shouldn’t transact with each other that is why they have to designate a banker. The banker will keep records and stock the chips for the game. If the players have excess chips, they may return it to the banker.